Percusionista Tomás Cruz es el conguero original del disco "Con La Conciencia Tranquila" de Paulito F.G. Cada tema del disco tiene su movimiento individual, su propia marcha y efectos, creado por Tomás como aquí lo ven ejecutado. Si usan el control de "Balance" en su sistema estereo notaran que Tomás está en el canal derecho y el tema del disoc en el canal izquierdo. Use your "balance" control of your stereo system to notice Tomás is on the right channel, while the song form the record is on the left. Movimiento de las tumbadoras en el tema "Con La Conciencia Tranquila"
About the album "Con La Conciencia Tranquila" - Paulito's masterpiece. This should be in the first batch for anyone starting a collection of Timba records. For the musician, every note of every instrument deserves careful study, and for listeners and dancers it's pure joy. The songs are immediately appealing, but have so many layers of musical detail that they never wear thin, even after hundreds of listenings. Noroña's piano tumbaos are from another world; Joel Domínguez' bass-playing is simultaneously more aggressive and more melodic than his predecessors; Tomás Cruz creates melodic conga tumbaos on a tune by tune basis and the three of them lock into a fierce groove with one of the world's best drummers, Joel Paez. The horn-playing and Ceruto's brilliant charts are endlessly creative. We could go on and on about this disc, and we will when we do our full feature on Paulito. 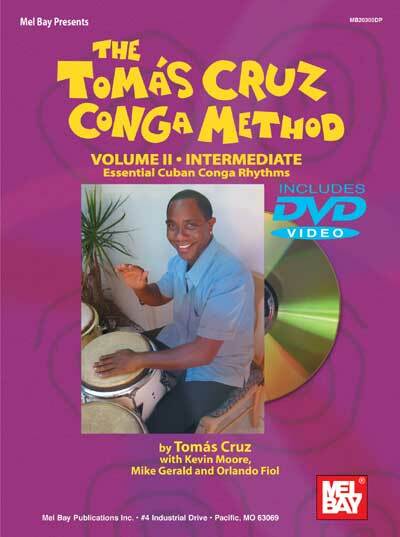 Tomás Cruz -en colaboración con Kevin Moore, Mike Gerald y Orlando Fiol- es el autor de tres métodos de conga / tumbadoras nuy populares que destacan el estilo usado en el g;enero de la timba (en la cual las tumbadoras comnpiten con la batería).